One more round honors before we dive into the championship season. Earning a Championship of America wheel pretty much guarantees you an Athlete of the Week honor. Penn’s miler quartet of Keaton Naff, Chris Hatler, Nick Tuck, and Thomas Awad earned their school’s first Championship of America win since 1974 by winning the 4xMile event in dramatic fashion in 16:26.30. We recap the race in our Penn Relays Day 3 recap. This is the 10th time the Quakers have won this event, the last time occurring in 1950. It should be known that Hatler and Awad were a part of the Distance Medley Relay that finished third in that Championship of America race in a new school record of 9:37.25, the seventh fastest time in conference history. 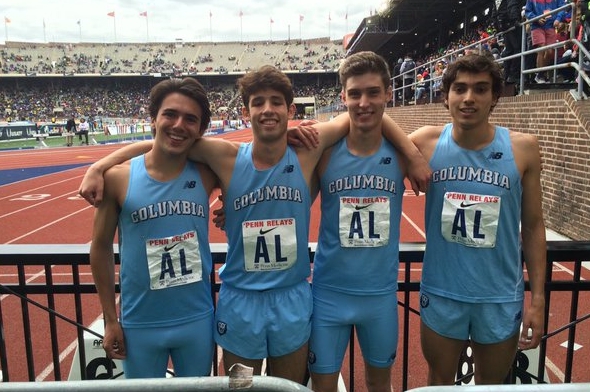 They may have gotten overshadowed with Penn’s wheel victory earlier in the day, but Columbia’s 4×800 relay deserves props. With a relay team of three freshmen –Josiah Langstaff, Sam Ritz, and Alek Sauer – the Lions reset their conference record in the event to 7:20.44 to finish as the runner-up in the Championship of America 4×800 race. Sauer was the fastest of the quartet. The team was anchored by junior Rob Napolitano. The College Women Shot Put Championship was highlighted by Daily Relay as one of the must-see events to follow at the Penn Relays due to the match-up of two of the top three from the 2016 NCAA Indoor Championships – Tennessee’s Cassie Wertman and Harvard’s Nikki Okwelogu. Okwelogu rose to the occasion – she won the event in a new season’s best distance of 56-03 3/4. The mark moves Okwelogu to the #9 ranking within the NCAA. Cornell rookie Ellery Bianco came within 0.02 seconds of her personal best in the 400m hurdles at the Big Red Invitational on Sunday to win the event in 1:02.67. The time is an ECAC qualifying time – one of three for the Big Red women at the meet. This entry was posted on Monday, May 2nd, 2016 at 11:15 am. It is filed under Athletes, Spotlight. You can follow any responses to this entry through the RSS 2.0 feed.